While doing some other work I decided to hunt down a long standing but very slow coolant leak. I followed the fluid stains up from under the car into the engine bay and eventually asked for some consensus on the forum. You can see the brief discussion and some excellent advice here. By the way, for anyone unfamiliar with the model designator lingo, an R50 is a first generation non-S Cooper. I cannot confirm but suspect this how-to applies also to the non-S version of the first gen convertible (R52). The process is similar for the first gen S (R53, and probably the S version of the R52) but there are a few differences and, I think, there are a few less steps for non-S cars. In fact, I found a helpful video made by someone (possibly an M/A member...I can't remember) removing and reinstalling the same parts in order to replace the thermostat on an R53 and I used that and my Bentley manual to do the work on my R50. I'll include a link to the video, below. See this link for an outstanding how-to for the R53. What you'll see below pales in comparison but I figure another (more R50-focused) perspective won't hurt. Time for a bit of a disclaimer. You don't need to put the car up on jacks and shouldn't be doing any heavy work so this ought to be a project with low risk of physical damage to your person. However, whenever tools are involved and force must be applied there's always a risk. Wear gloves and goggles and take your time. Above all THINK your way through each step and be careful in there. If you hurt yourself doing any of this relatively simple work it's on you, not me. If it gets to be a bit of a challenge for you, button it back up and take it to a shop. The Bentley manual says you need to remove both your battery box and air box. I had both of mine removed already (as I said, I'm doing other work) when I got to this point so I can't confirm this but it looks like you might be able to remove and replace the thermostat housing without taking out the battery box. You could try it. Worst case if it doesn't work is you'd have to stop and remove the battery box. My guess is it might be tough to pull one of the coolant hoses with the battery box in the way. Rather than including battery box and air box removal instructions here I'll refer you to my addendum page for this article. It's about another procedure so skip to steps 3-5 and ignore the biz about the fuze box. I'm sorry there aren't good air box removal instructions but as you'll see I no longer have a stock air box so you're sort of on your own there. Trust me, if you're starting to do this sort of work on your car you'll thank yourself many times over for investing in a Bentley manual. I also removed the big air hose that connects the air box to the throttle body. It's extra work and not necessary but it's tight quarters in there and the rest of the job was much easier with that hose out of the way. And now using my pics and text. 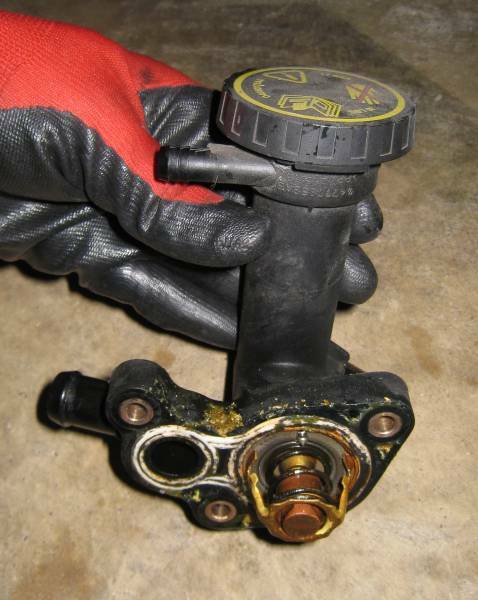 You'll need to disconnect 3 hoses (A, B, C) and remove 3 bolts (D, E, F). I know, you can't see C of F in this pic...keep reading. I wondered why there was no clamp on my car on the hose at A. Apparently that's normal, it's just a friction fit. The hoses at B and C have spring clamps. You can't actually see C, I didn't manage to get it in this pic so that arrow is an approximation of its location; more help with that below. You can loosen the spring clips with good pliers, just squeeze the ends together until they touch and then slide the clamp past the flange and down the hose a bit, like so. ^ That's hose C, by the way. Prepare to deal with the coolant that drools out when you pull those hoses. It will run all over the side of the engine and the transmission and end up on the floor so get a basin of some kind...preferably low and wide...and maybe a couple of them. You aren't going to drain the entire system but will need to catch a pint or so and it won't be cooperative and all dribble nicely into a single small spot directly below where you're working. The bolt at arrow F is hiding in that first pic (like hose C). The pic below will help you to see where you'll find those hiding items. 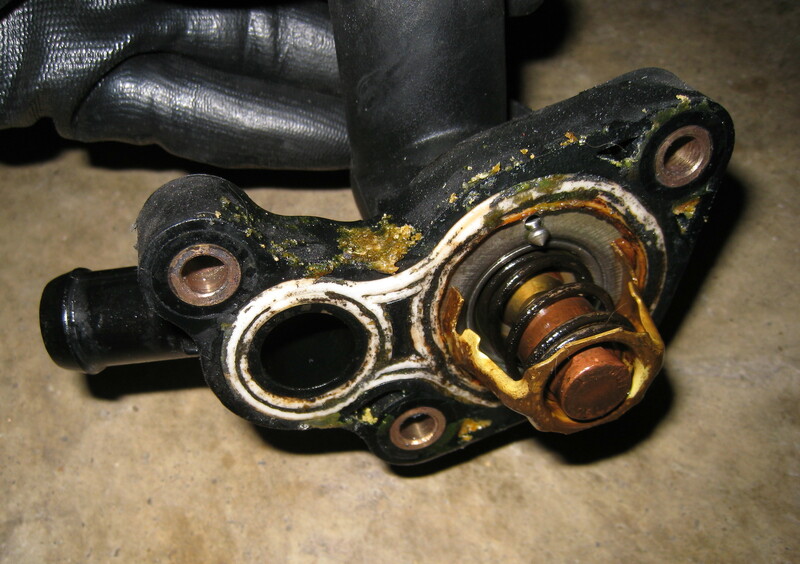 With the hoses and bolts removed, grab the housing and wriggle it through wires and hoses to get it out. Here's the business side of mine, immediately after removal. By the way, if the thermostat and gasket stay in the housing, leave them there for now. Definitely do not separate the thermostat from its gasket. More on this later. And there's where it came from. Yikes! You need a flush mating surface so all that gunk needs to come off. If you don't have a leak and you're just replacing your thermostat you might not see this sort of mess. I think it's build up because I've had a very slow leak going on there for a long time. Wipe off what you can and then scrape off the rest. I used a razor blade scraper and it worked great but be very careful to not nick any of all those wires or hoses. Also be careful to not gouge the metal...might be better off with a plastic scraper. Here's the new thermostat and gasket next to the new housing. My thermostat came already wrapped by the gasket. If yours are separate, study your old unit for orientation of the thermostat in the gasket. The thermostat needs to be installed the right way round and the right way up. Go to the video linked above and jump to the 7:30 point for one explanation. 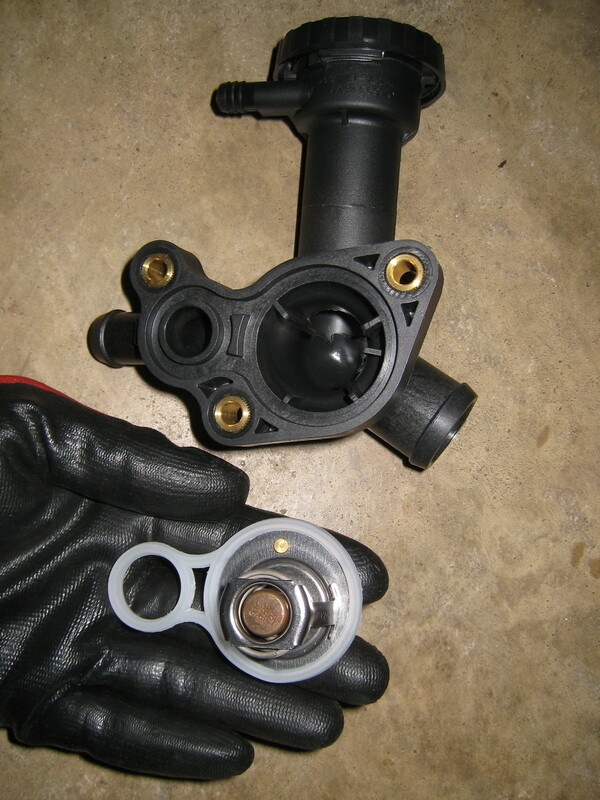 Once you have your thermostat correctly lined up in your gasket, you need to fit it into the housing. If you line things up like they are in this pic, and as long as you have the right side of the thermostat facing toward you (again, see the pic), you'll find that the gasket will fit easily into the groove in the housing. If it's a struggle, turn it over. Now, look again. If you don't see this side of the thermostat facing you (see below), start over. Press the gasket firmly into the groove. By the time I'd worked my housing back in place and was trying to get the bolts back in, the thermostat and gasket slipped out of place. There was no way I could get them back where they belonged with the housing nearly installed and I had to pull it back out and try again. This is important! If the gasket isn't in the groove in the housing when you tighten down those bolts to remount the housing, you won't get a good seal. So, with the gasket as well seated as you can get it, carefully (so you don't dislodge it) maneuver the housing back through the wires and hoses. Install the bolts finger tight. Remount the hoses and don't forget the clamps. Then get out your torque wrench and tighten the bolts to 9 ft-lbs (per the Bentley manual). Now clean up as well as you can and reinstall the battery box (if you removed it), the air hose and the air box. Time to refill the system with coolant and bleed. The filling/bleeding instructions below are a hybrid of info from Keith's excellent R53 how-to (linked above) and a few R50 specifics from the Bentley manual and my own experience. Both BMW and MINI antifreeze are free of Nitrites and Phosphates which can encourage precipitate from the coolant mixture, and both are concentrates, which are mixed with distilled water before pouring into the coolant expansion tank. Follow manufacturer's recommendations for mixture ratio. Use only BMW approved coolant. 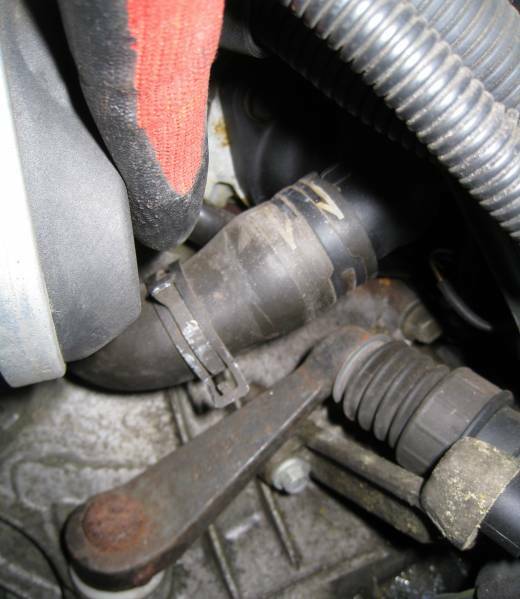 Loosen the vent screw in upper radiator hose. See red arrow, below. You probably didn't lose much coolant when you replaced the thermostat/housing, so it's possible coolant will immediately start leaking. If it does, close it right away. 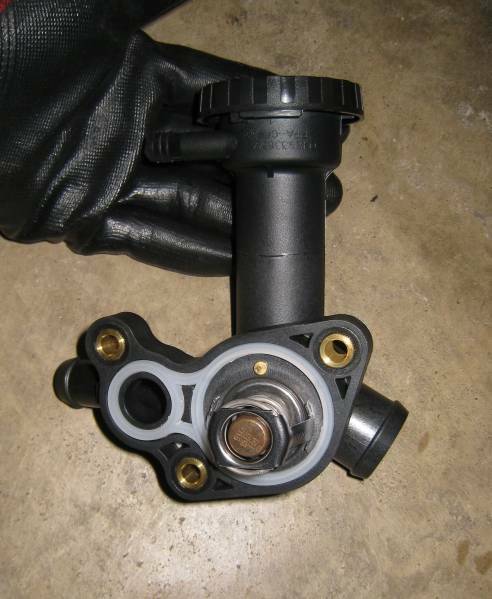 Remove the pressure cap and slowly pour coolant mixture into the filler neck. 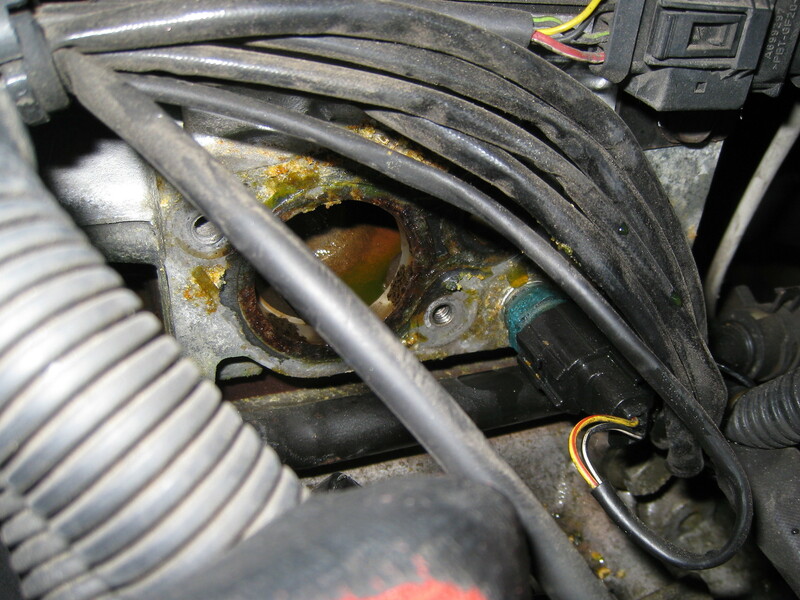 If you haven't already done so, tighten the vent screw as soon as coolant begins to emerge. Continue to add coolant until it reaches the inner ring of the filler neck. Fill the overflow tank to the MAX mark. Start engine and run at idle. Watch level in expansion tank and top off until the level stops dropping. Allow engine to cool completely and open the bleeder screw again till fluid escapes then close. Adjust coolant level in the expansion tank if needed. 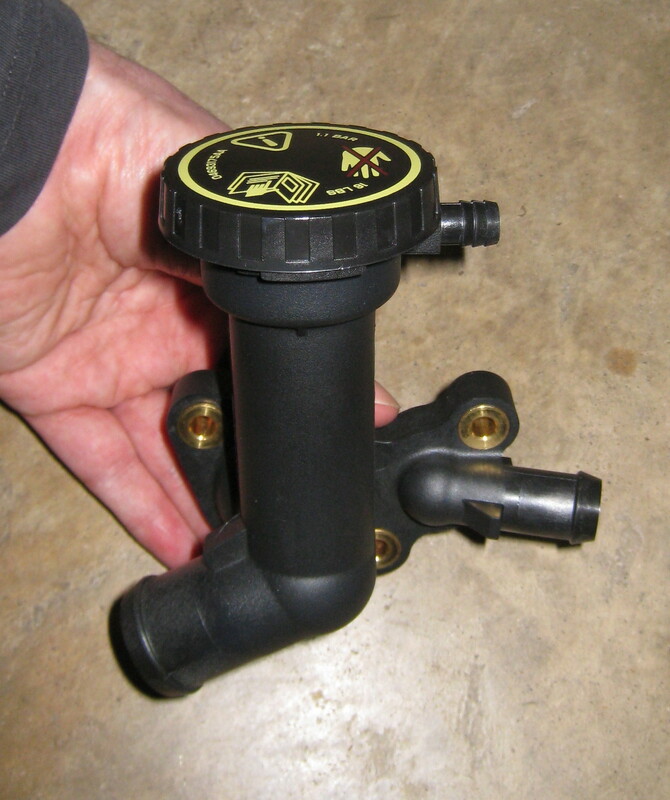 Check fluid level before the next couple cold starts and adjust again if needed. Watch for evidence of continued leaking.